Terpenes and terpenoids are everywhere. They are found ubiquitously in nature, and are the primary constituents of the essential oils of all botanicals. Because essential oils are complex mixtures of compounds, humans are not typically exposed to individual terpenes and terpenoids in isolation. For example, the scent of a fresh bunch of lavender is anchored by the terpene component linalool, but it is the unique pattern of many aromatic components that allows us to recognize it as lavender. Terpenes are a class of molecules that are built from a common biosynthetic precursor called isoprene [2-methly-1,3-butadiene]. Isoprene is a hydrocarbon building block that contains five carbons and eight hydrogen atoms [C5H8]. And because terpenes are made from these building blocks, they contain multiples of five carbons. For example, monoterpenes such as limonene and pinene contain ten carbons [C10]. Sequiterpenes, such as β-caryophyllene and α-humulene contain fifteen [C15]. Diterpenes, such as phytol, contain twenty [C20]. Terpenoids are derivatives of terpenes that have undergone further biosynthetic modification, such as adding an oxygen atom. For example, menthol is produced by peppermint from D-limonene in six steps. Some researchers use the term “terpenes” to also include terpenoids, whereas the term “isoprenoid” is a better choice for referring to both terpenes and terpenoids collectively. Plants and animals use terpenes and terpenoids to communicate with the world around them. The message D-limonene may be sending from a juicy mandarin to a human is “eat me” (so you can spread my seeds around) whereas the message D-limonene may send to an insect is “stay away!” The idea that terpenes can act as messengers and exert physiological effects beyond smell and taste is not simply theoretical. For example, adults and adolescents are directly familiar with the actions of steroid hormones, which are derived from the triterpene squalene, and how those hormones cause changes in our bodies and moods. β–Myrcene Mango Terpy, herbaceous, woody, hint of rose, celery, carrot, & balsalm. α-Pinene Rosemary & Pine Fresh, camphorous, pinney, turpentine-like, cool, herbal lift. When we talk about the olfactory system, the human nose is only the beginning. There are approximately 400 different types of receptors in the human nose that act as chemical sensors. However, those 400 receptors allow the olfactory system to recognize one trillion different scents! How does this work? Similar to how all life on earth can be determined with only 4 DNA bases, or how all computer data can be encoded with only 1s and 0s, a few building blocks can encode a rich diversity of information. Receptors in the nose respond to a range of compounds, and a single odorant molecule may also bind to multiple receptor types at once. The ability to discriminate olfactory patterns never before encountered, equips our sense of smell with the power to recognize novelty. There are parallels to the immune system in this pattern-sensing power. Unlike the immune system however, the brain handles the interpretation of olfactory sensory information. By smelling and identifying different compounds and mixtures of compounds, you can train your brain to better tune-in to the complex tapestry of the olfactory world! We often think of the nose as our organ of smell, so it often comes as a surprise to learn that the chemosensory ability to detect volatile and fluid-phase odorants is not limited to receptors found in the nose. Other types of receptors found in human airways and the mouth also sense odorants. In fact, the sensory signals from these other areas become intertwined and cross-referenced with signals from the nose as they ascend into the brain. This can be understood when trying to enjoy the taste of a favorite meal with a stuffy nose. The sense of smell is unique among the traditional five senses in that sensory information is sent directly to the amygdala, which plays a leading role in emotions and feelings. Data from the other five senses is first sent to sensory cortices, such as the visual cortex, before being relayed to other areas of the brain. Because of this direct nose to emotions connection, scent memory can lead to powerful responses that seem beyond our conscious control. For example, getting a whiff of the perfume that your grandmother used to wear may trigger vivid memories and feelings. Such memories may be very different than others triggered by the scent that your first girlfriend/boyfriend wore, although no less vivid. Evolutionarily, this direct nose to emotions connection may have allowed for survival advantages in terms of hunting, gathering, and predator avoidance. In addition, this anatomical arrangement suggests that the origins of the olfactory system stretch back further into the evolutionary history of our species than any other sense. In addition, this scent to nose connection may extend beyond just sensory data signals, allowing matter and molecules to bypass the blood-brain barrier, a network of gates that restrict what compounds can enter and leave the brain. In fact, this link is a hot topic in Alzheimer’s Disease research, potentially linking particle pollution to AD. This is based on observations of degenerative neurological diseases and the loss of smell. If this holds true, the health of the olfactory system determines to some extent healthy brain functioning. One interesting aspect of cannabis, and all botanicals in general, is the presence of “ensemble effects.” These effects occur when there are multiple physiologically active compounds in a botanical beyond the chemical component of primary interest. The allusion within the phrase is that these other active compounds are part of what modulates the primary active component’s effects. In cannabis, tetrahydrocannabinol (THC) is typically considered the primary active component, as well as cannabidiol (CBD). However, other cannabinoids are usually present in cannabis that can modulate the physiological effects of THC. Terpenes and terpenoids also play a large role in this modifying and tuning, that is the basis for ensemble activity. Linalool, which is a terpenoid often found in cannabis and in high concentrations in lavender oil, is generally believed to have sedative properties. However, not every cannabis composition containing linalool is known to be sedative, as it takes the right ensemble to get that. A direct chemical connection from the nose to the brain also suggests an additional mechanism by which things we smell can change our brain chemistry. The discipline of aromatherapy contends that different essential oils and odorants can impact our brains and behavior. However, many scientists have dismissed aromatherapy as pseudoscience due to limited hard evidence for such effects. Yet this direct connection to the brain may mean that a very small number of molecules, potentially orders of magnitude fewer than through the respiratory or digestive tracts, are capable of triggering an effect – or ensemble effects. 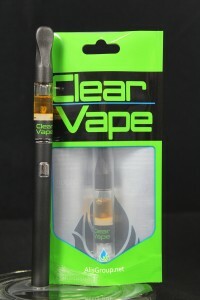 Clear Vape only utilizes food-grad compounds of known purity to make all flavors and sensory training standards. You can rest assured that you are not inhaling some “essential oil” purchased from the internet with an unknown composition. Clear Vape utilizes a flavor classification system that provides information about our various blends. 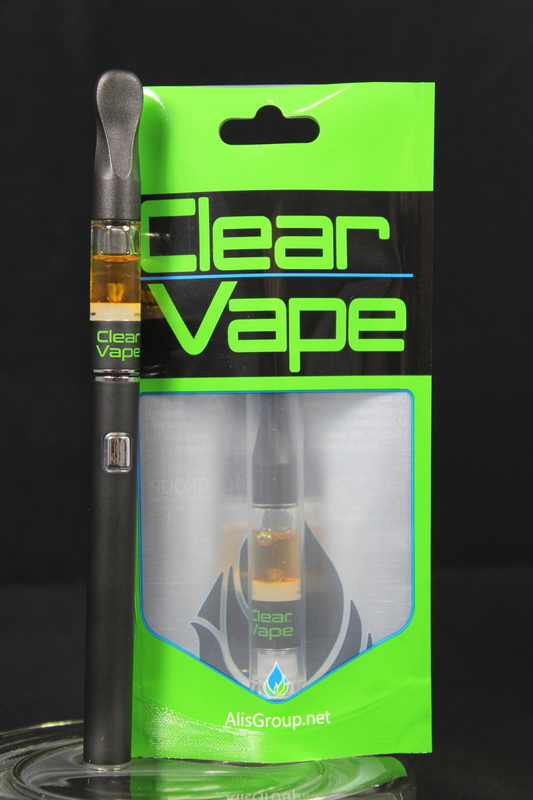 To help understand what you’re consuming, Clear Vape has three categories: Native, Strain Native, and Inspired. Every single food-grade compound used in a native blend has been found in cannabis. The Native designation lets those consuming our products know that 100% of a Native flavor has its roots in actual cannabis. This should provide comfort to the cannabis purist and those considering the safety of inhaling flavors alike. If you are comfortable inhaling cannabis, you can be comfortable inhaling Native. Strain Native blends are a subset of Native, going one step further in that the components of the blend are present only in the proportions found in actual strains themselves. 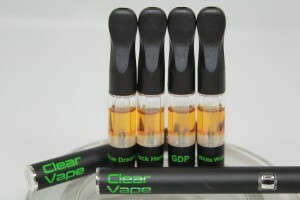 For example, the Jack Herer blend is a representative recreation of many different Jack Herer analytical fingerprints. 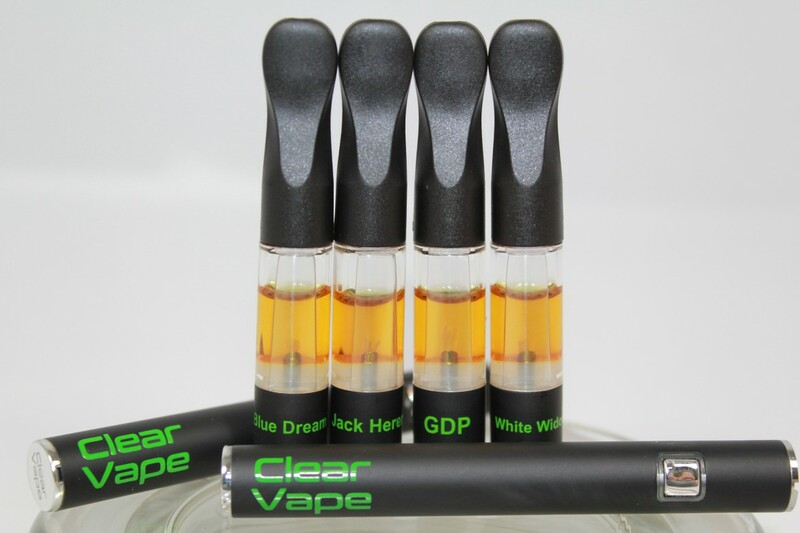 Not all Jack Herer samples are exactly the same, but Strain Native blends approximate the key characteristics and component levels of the class. Inspired formulations begin with Native blends. 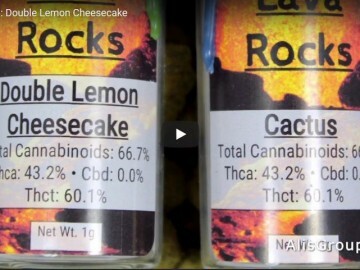 Then one or more additional flavor components, not found in cannabis, are layered atop the Native bends to create a unique Inspired formula. Inspired blends can be expected to have the “ensemble effects” attributed to the complex terpene composition found in the plant. Inspired blends allow for the use of an expanded palette of food-grade compounds in designing flavors, while allowing the consumer to decide whether that fits with their own philosophy regarding health and wellness. We believe the field of cannabis is only in its infancy, and has already received a tremendous amount of interest for numerous health applications. Informed decision making is important. We believe in science, standards, and specificity are the origins of informed decisions. This doesn’t always make things simple, but it helps avoid over-simplification. It’s our goal to provide accurate information so that considered decisions about health, exploration, and happiness are the individual’s to make.